Active LogView is a web log analysis program which provides analysis of total requests, unique visits, advanced referrers list, hourly summary, user agents list, OS list, advanced filtration, advanced search and more. It does not require importing the log file to a database - the analysis is performed on the log file itself and not on a database. As a result Active LogView performs log analysis faster than most analyzers. Importantly, log analysis and reporting are performed in Real-Time. The program can analyze multiple log files. Multiple log files are reported as if they are one continuous log file to view historical trends. Statistics can be accessed from any computer that is connected to the Internet. No other software is needed. The included password protection gives only authorized persons access to the administration area. You can also password protect viewing statistics. Active LogView is a 32-bit native application for Windows XP/2000/NT/98/95. It is written in C++ for stability, speed, and minimal use of system resources. Log file format supported: MS IIS, Apache. The executable Active LogView is only 50 kb. 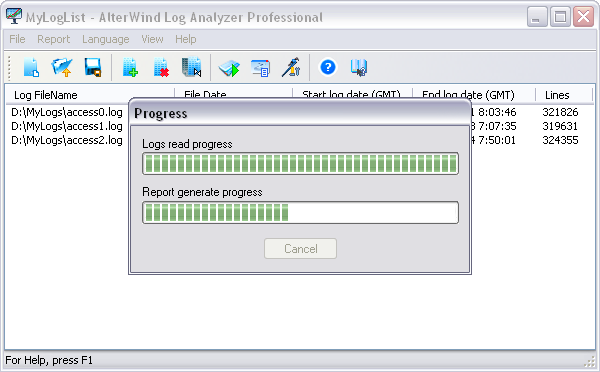 AlterWind Log Analyzer is the unique web server log analysis software that offers comprehensive reports on every possible aspect of web site operation otherwise left hidden from your eyes. Use this software to grab web server logs (all formats supported) and build graphically-rich self-explanatory reports on web site usage statistics, referring sites, traffic flow, search phrases and much more!